Home » Pain » Can Simple Lifestyle Changes Fix Your Arthritis? Arthritis is a very common condition that most of us will encounter as we age. The most common form is the age-related type where you get up in the morning and your joints are achy and tight. The more common areas affected include the knees, hips, spine, and hands. There are many recommendations regarding the management of arthritis including physical therapy, medications, dietary changes, rehabilitation exercise, herbal medicine, and nutritional supplementation. As a person who suffers from this common disorder, it can sometimes be quite confusing regarding the safest and most effective manner in which to manage your arthritis symptoms. Now, some new research may make this decision a lot less complicated for you. Research findings published in the Journal of The American Medical Association has found that in overweight patients suffering from knee osteoarthritis, the most common type of arthritis, those who lost 10% of their body weight and combined changes in diet with exercise experienced a better clinical outcome, compared to individuals who relied upon diet or exercise alone. 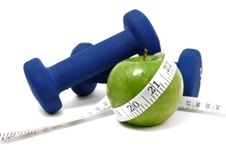 “Overall, diet and exercise together were more effective than either diet or exercise alone. Patients who had diet plus exercise had less inflammation, less pain, better function, improved health-related quality of life, and better mobility. The diet-only group had greater reductions in knee joint loads than the exercise comparison group,” said lead author of the study, Dr. S. Messier. “There was a significant dose–response effect associated with weight loss. People, regardless of group, who lost at least 10% of body weight had significantly less pain, better function, reduced joint loads, and reduced inflammation compared to people who lost between 5% and 10% or less than 5% of their baseline body weight,” he said. The study evaluated 454 obese adults over the age of 55 years old who had radiographic and clinical evidence of knee osteoarthritis. The subjects were divided into three treatment groups:one group followed a specific diet and exercise regiment; group two followed only a diet; and the third group participated in an exercise-only protocol. The diet consisted of two low-calorie liquid meal replacements and a low-fat dinner that was replaced by low-calorie meals totalling 800-1,000 calories after the first six months of the trial. The exercise program consisted of walking and strength-training exercises completed three times per week. The results of this study indicated that at the 18-month follow up, those subjects who exercised and consumed the diet lost the most weight, had less knee pain, better function, better quality of life, and greater walking speed than the groups who had diet or exercise alone. What’s most interesting is that the subjects who participated in the diet and exercise program had lower levels of interleukin-6, an important chemical marker of inflammation. Dr. Messier suggested “All 3 groups had the same reduction in pain after 6 months. It was not until 18 months that the diet plus exercise group separated itself from the other groups, reducing pain by about 50% in the participants who completed the study.” This is very exciting news because it is precisely the symptoms associated with arthritis that can adversely affect the quality of life a patient has! The study results also point to a very important concept in the management of this very common form of arthritis. Arthritis of the knee is commonly associated with early degeneration because of obesity. Utilizing a treatment approach which emphasises activity or therapy alone is often less effective because it has not involved a reduction in body weight so crucial for relieving excessive joint stress. A combined approach of diet and exercise that is targeted for weight loss and improved joint function is the key to the successful management of this very common condition. Kelly, J.,“Arthritis Knee Pain: Exercise and Diet Tops Diet Alone,” Medscape web site, September 26, 2013; http://www.medscape.com/viewarticle/811782, last accessed, October 1, 2013. Messier, S., et al.,“Effects of Intensive Diet and Exercise on Knee Joint Loads, Inflammation, and Clinical Outcomes Among Overweight and Obese Adults With Knee Osteoarthritis. : The IDEA Randomized Clinical Trial,”JAMA2013;310(12):1263-1273.